Google on Thursday confirmed that in-page search firm Apture has been purchased for an undisclosed sum, a move that will likely bring the search platform into the Google Chrome web browser fold. Apture’s main piece of technology is a product called Highlights, a product that is embedded in websites while allowing users to search within those pages. For example a website visitor can highlight any words in an article to receive a small overlay in their browser window with links to contextually relevant text, videos, photos and other information. While Vector provides direct content, for example information from TechCrunch, Twitter, Flickr and Wikipedia the website has always used Google search results to find that information. Apture also including videos from Google owned YouTube and pictures from the Google Image search product. Current Apture is available through Chrome, Firefox and Safari extensions and it’s still unclear if all browser extensions will remain available as Google devours the company. 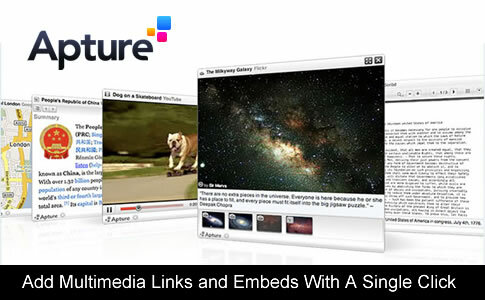 Apture Highlights is used on various sites including Hearst, the Reader’s Digest and the Financial Times. Do you think the Google acquisition of Apture will make the product even better?